"Made for Europe" was Yamaha's proud boast when it launched its 1000 TR 1 in 1980. In fact, this big V-twin - which broke with all the Japanese conventions - seemed petfectly rational for touring on the European road network. Though factoty gossip claimed that Yamaha had cut up a superb Vincent in an attempt to uncover the secrets behind its legend, the TR 1 was an entirely original motorcycle that owed nothing to anyone. 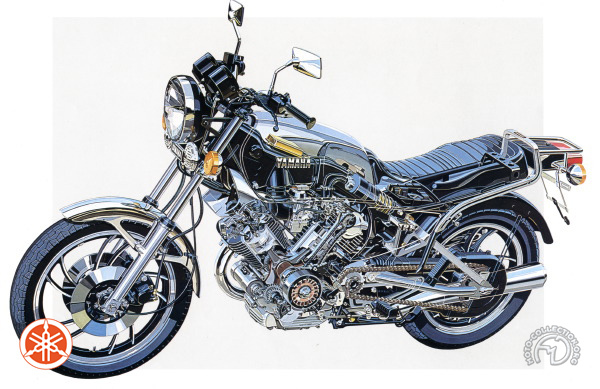 Yamaha, a specialist in creating new fashions, had succeeded in reviving the four-stroke big singles and now wanted to reinvent the V-twin. The product planning team and the designers of the initial concept models were all British, and this personality was deeply embedded in the definitive version of the TR 1. To this traditional concept, Yamaha added its technical know-how. The engine formed a structural member of the backbone frame, which had cantilever rear suspension with a triangular swing arm acting on a single damper under the saddle. Deliberately austere in style, the TR 1 had an unsprung rear mudguard, which was effective but unpopular. The TR was simply too original and deterred potential purchasers. It promised well but was spoiled by errors of judgment. Its roadholding was unpredictable, and its engine, though well-mannered and full of torque, was less effective than the fourcylinder and unreliable. Yamaha had blown its chance, and, after an ineffective face-lift, the TR 1 was withdrawn in 1984. Too original and a victim of annoying teething troubles, the TR 1 was only marketed between 1980 and 1984.